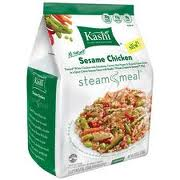 Kashi Steam Meals Only $1.49 at Target! Target is having a sale right now when you buy 4 Kashi Frozen Steam Meals ,Combine the Target Coupon with Manufacturer Coupon to crab each item for $1.49! 5.Use $1.50/2 coupon for Kashi Frozen Entrée – (redplum.com). 6.Pay $5.97, Get 1 Free. 7.Final Price for each item $1.49 , when you buy 4.